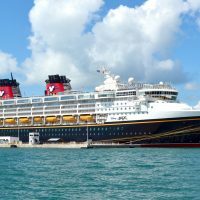 One of the highlights of our recent Disney Cruise vacation was the day we spent on Castaway Cay, Disney’s private island in the Bahamas. From 8:30 a.m. to 5 p.m., our ship had the entire island to ourselves. I left for this trip without doing a lot of my normal intensive research, so I wasn’t as prepared as I could’ve been for our adventure ashore. Here are some things I wish I had known in advance. First of all, if you want to sound like you know what you’re talking about, it’s pronounced Castaway “key,” not “kay.” And if you want a beach chair, get off the ship and onto the beach no later than 9:30 a.m. There is a tram that makes stops at the three main beach areas. And there are a few important things to bring with you: sunscreen, sunglasses, bottled water and beach toys. We brought our own reusable water bottles on this trip, so we filled them that morning at the complimentary drink stations on the ship. Towels are provided to you after you disembark. You can buy bottles of water on the island, but this can get pricey. Sunscreen, beach toys, goggles, etc. are available for sale at the two gift shops if you don’t have them, but why pay when you can bring your own? 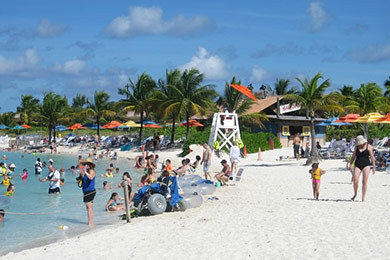 There’s a lot more to do than just laying on the sand, like biking, snorkeling, watercraft rentals, parasailing, etc. However, there’s a charge for every activity. I was surprised and a little disappointed to learn that there was a hefty fee for Castaway Ray’s Stingray Adventure, especially since the planning DVD doesn’t let on that there’s a charge for this. 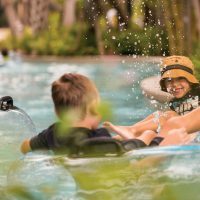 There’s even a $10 rental fee for inner tubes and foam rafts. Had I planned better, I would have packed my own inflatables. Regardless of the fees, you don’t need to bring any money with you. As long as you have your “Key to the World” card, you can charge anything you purchase to your room. The only exception is if you want to send a postcard from the island’s Post Office. It will need a Bahamian stamp, which you can purchase with cash there. The amazing supervised children’s program isn’t just onboard the ship either; it’s on the island, too! 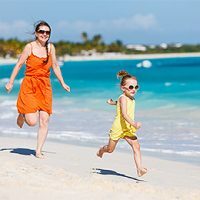 You can drop off your kids at Scuttle’s Cove, and head off to the adult-only beach, Serenity Bay. They will be cared for, entertained, and fed by the same well-trained childcare staff, with games, activities, and water play area. There is no extra fee for this program; it’s included in your cruise fare. 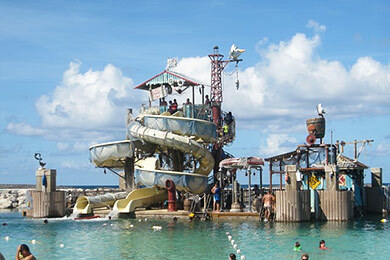 The main water attraction is Pelican Plunge, which contains two fast-moving waterslides, two water cannons, and a large bucket that pours out overhead every few minutes. However, it’s on a dock, and you have to swim out to it — through deep water — to reach it. There are life jackets provided, and anyone under 38 inches is required to wear one to swim over to it. Eat lunch early; it’s served from 11:30 a.m. to 2 p.m. This is not only to avoid crowds, but also to get there before the seagulls start swarming. We heard a high-pitched whistle tone over the PA system the entire time, which presumably is used to keep the birds away. It didn’t really work, and it bothered my son and husband, who are sensitive to certain sounds. You can, however, bring your lunch tray to the beach if you want to eat there. The two gift shops — Buy the Seashore and She Sells Sea Shells and Everything Else — carry special Castaway Cay souvenirs that you will only find there. If having unique Disney merchandise is your thing, stock up there. 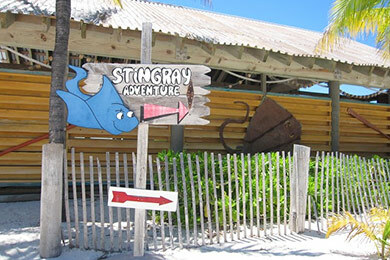 What other tips do you have for visiting Disney’s Castaway Cay? Comment below!